Sausage and onions are one of my husband Pete’s favorite meals, so I created a way to make it somewhat healthy (i.e. vegetables) with this Italian Sausage Skillet with cannellini beans, tomatoes, Italian sausage and spinach. 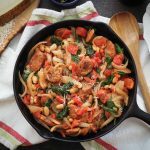 Inspired by our recipe for Portuguese Sausage & Beans, this one-skillet dinner is low carb and faster to make….